Ever wonder what to do with all those used candle jars? If you’re like me, you hold on to them because you know you will eventually use them 😊 Today’s post is one of the many ways you can repurpose those jars. More recently I started noticing small plastic plants, such as succulents, being sold almost anywhere. I thought these would be a great way to add some greenery around the house. Glass jars that were sprayed painted gold. Ceramic candle jar that was only cleaned but not painted. Sometimes you just need a little something, like these small pots, to change up a room, desk, hallway, or any area in your home or office. We hope you enjoyed this project and that you will share with us your thoughts and comments about it. Thanks for stopping by and Happy Mother’s Day to all the Mothers out there! At our house, that would be my husband, Jeff. His collection was steadily growing and even though we had already used some corks in other projects (posts to come), they never used up many corks. So I decided to make something a little bigger which resulted in this heart (about 2ft tall by 1.5ft wide). I cut a heart out of compressed cardboard (strong enough to maintain its shape without bending while thin enough to go practically unseen underneath the corks) using a power jigsaw. I then sorted the corks by wine stain color (some corks had no stain while others had a rich ruby tone to them). I did this because I wanted the heart to have a gradual darkening color toward the tip. And final step was gluing the corks onto the board with a hot glue gun (being careful not to burn any finger as I’m notoriously know for doing when using my glue gun!). And that’s it! A simple project for a lovely handmade wall décor. You can easily put your on twist to this project by changing size or even shape. We would love to see your interpretation so please be sure to share with us. 2. Cork is the outer bark of the cork oak tree. 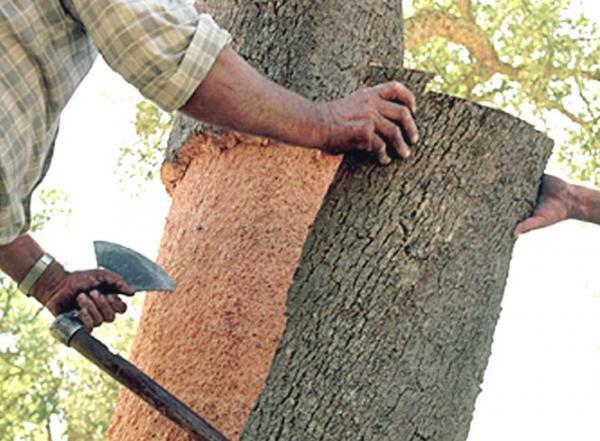 The first harvest of cork is not stripped until the tree is approximately 20 years old. 3. Each tree can be harvested once every 10 to 12 years. 4. On a cellular level, cork looks like a honeycomb of air pockets. These pockets make cork both buoyant and fire resistant, which is why it’s quickly becoming a popular home insulation material. This is the same reason cork works so well to age wine — its molecular structure makes watertight seals easy, but lets tiny bits of air move in and out, allowing the flavor and aroma molecules of wine to evolve and become more complex over time. Mother’s Day is just a few days away and we are thinking of different gifts that can be made for mom. What better way to say ‘I love you’ to your mom, the mother of your kids, the mother figure in your life, to whomever!, then with something you made! We found wine bottle bird feeders and tea cup bird feeders on Pinterest and here was our take on those posts. We used whichever material we had at hand. The wood was old fence wood and other scrap pieces we had. We used leftover roof shingles but if we didn’t have any, we would just have painted the roofs. Used wine bottles and tea cups found at thrift stores. The bird feeders were either: painted with one coat of white paint, sprayed painted with clear or stain sealer , or sprayed painted with a white chalk color. The idea is to use the materials you already have and not feel the need to purchase any item, for example, paint that you might only use one time. Before picture of tea cup bird feeder. Left side is a clear stain spray. Right side is wood stain with color. Left side is white paint and right side is white chalk spray paint. Bag with bird seed to give with bird feeder. Disclosure: We are not promoting any product. There is no compensation. We are simply showing which products we used.